As social media professionals, I believe this is one of the two biggest struggles we have both with our clients and with our bosses, the other being actually what to post, but that is a completely different topic. More is not always better when it comes to Facebook. Ignoring the fact that most fans never return to a page after they like it, people get frustrated and annoyed by constant posts. Worse than that: now you, the social media professional, has to come up with a large amount of posts. When posting three or more times per day, most of those post are worthless with little value to the fans. One-to-two posts a day is more effective than fewer or more posts per day. 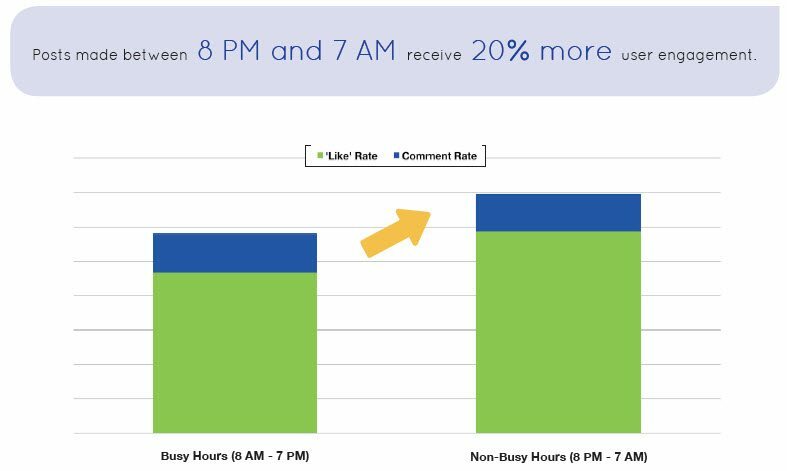 One or two brand posts receive 32% higher “like” rates and 73% higher comment rates compared to posting 3 or more times a day. Engagement is highest when brands post four to five posts a week. Posting one to four times a week produces 71% higher user engagement than five or more posts in a given week. Posting less than that, does not maximize your opportunity to target your fans as often as possible. Clients may think the easy to fix to a low level of Facebook engagement is more posts, this will never work. Content is king. Visually appealing posts get more engagement, along with questions and discounts. In short, be sure to experiment with what you post and the times you post. You may be surprised to see when you are getting the most engagement.